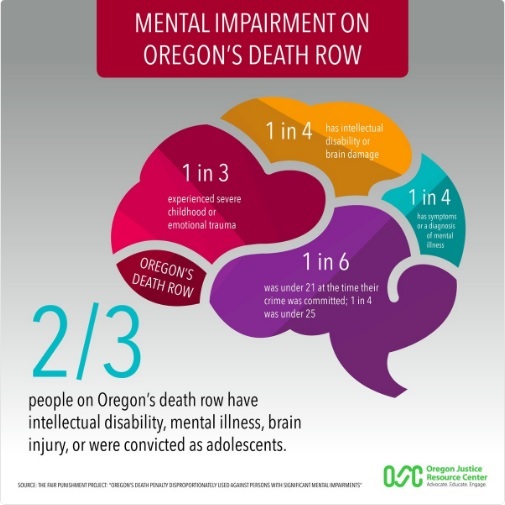 (C. Parks, "Most Oregon death row inmates suffer significant mental impairments, Harvard report finds," The Oregonian, December 21, 2016; "NEW REPORT: OREGON’S DEATH PENALTY DISPROPORTIONATELY USED AGAINST PERSONS WITH SIGNIFICANT MENTAL IMPAIRMENTS," Fair Punishment Project, December 20, 2016.) See Mental Illness and Intellectual Disability. Graphic by the Oregon Justice Resource Center (click here to enlarge)..